On a stormy night, Devendra (Dilip Kumar), an engineer, drives down a hill road with his friend to fetch his wife and child from the railway station. A landslide blocks their path and the friends take shelter in an old mansion off the road. Devendra finds the house uncannily familiar. In the large front room, he finds an old portrait which he recognises. His friend and the old caretaker join him, and Devendra, amidst flashes of memory from another life, sits down to tell his story while the storm rages outside. Anand (Dilip Kumar) had come to Shyamnagar Timber Estate as its new manager. An artist in his spare time, he roamed the hills and fell in love with Madhumati (Vyjayantimala), a tribal girl whose songs have haunted him from a distance. Anand’s employer, Ugra Narayan (Pran) is a ruthless and arrogant man and, as Anand refuses to bend down to him like others, he incurs his wrath. Anand has enemies among his staff. 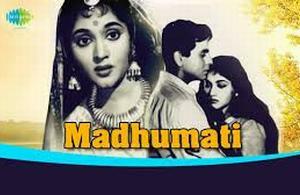 Sent away on an errand, he returns to find that Madhumati has disappeared. He learns that Madhumati had been taken to Ugra Narayan and confronts him, but he is beaten unconscious by Ugra Narayan’s men. While the men are taking Anand’s body out of the palace, his men meets with Madhumati’s dad (Jayant) who had to fight for his own daughter’s death. He does it and wins but dies laying down in the road while Charandas (Johnny Walker) hides then takes Anand’s body to the hospital.